The Malabar X is the tenth personal yacht made by its own designer. The world famous architect John Gale Alden. This yacht is one of the most important of the naval recreation design history. It was the last personal Alden’s Schooner and the most victorious one. Being the summit of the architect’s career. In 1930 won the Bermuda Race on its class and in 1932 won it again leaded by the yacht designer. In this same regatta five other Alden’s Schooners ranked in the first ten positions. It was the swan’s song of the American Schooner, condemned because of its lack of a large spinnaker for the bearing courses due to too low foremast. The Malabar X was damage by the Rob Hurricane, which hurled against the mooring dock causing severe damages to the yacht. Shortly after was bought for 35.000 dollars, according to the Lloyd’s Register and submitted to a meticulous restoration, under Alden’s supervision, what enables to recognise easily the original parts. 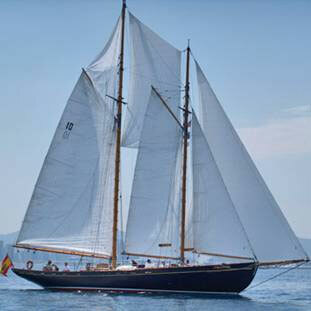 Nowadays the Malabar X sails gracefully in the Mediterranean waters with a Spanish flag and port registered in Barcelona.